My ears suffered for years, but I plug on with the cans, because I get the best critical-listening experience that way. Now I have hearing aids, which I still have to take out to enjoy my headphones without the aids "correcting" the sound for me. And you know the only time I experience a tinnitus-resembling artifact from listening? When I tuck the hearing aids back in, and get a jolt of feedback just from poking them into my canals! As one who has always invested large amounts of money into audio gear (or wanted to), I have always taken great care of my hearing (I habitually carry earplugs with me wherever I go). This awareness began over thirty years ago when I was in college. A classmate of mine who lived in the dorms, was also somewhat of a budding audiophile, gave me some sage advice about headphone use. He said a general rule of thumb about volume is that if you have music playing through your headphones and hold them at arms length, if you can still hear the music emanating from them (even faintly), then you're playing them too loud. PhilBiker and The Revealer like this. 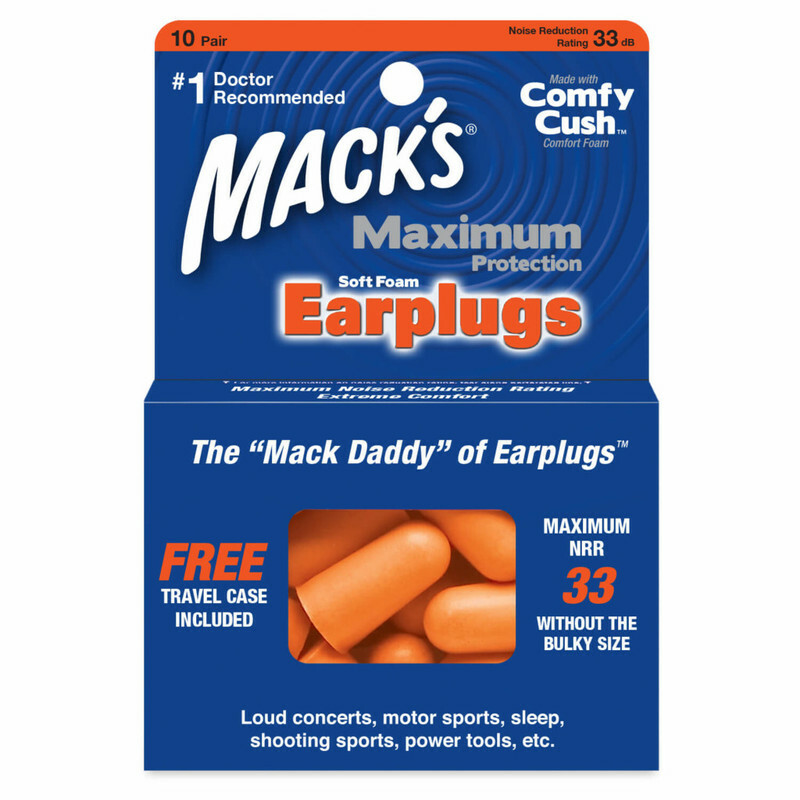 Ear plugs wherever and whenever, especially in today's movie houses, is the only way to go, my friend. 33db noise reduction is what I use. basie-fan, showtaper, PhilBiker and 6 others like this. I use these things to play drums, to go to shows, and to catch flights. showtaper, PhilBiker and Matt Richardson like this. We go to great lengths to protect our eyes from damage, and in some countries the sinus and lungs, pathogen reduction such as Japan. Hearing protection has never been of wide public concern. Our public places are hearing loss kiosks, loud exhaust pipes, car horns, sirens, subway brakes, construction sites, auto-body shops. Manufacturing sites are regulated here in the USA via OSHA safety standards, but not our public places. If a prankster sets off a firecracker near someone's ear, nothing can be done legally to compensate for any resulting hearing loss/ permanent tinnitus. The only defense is to wear hearing protection. How much is a question, since perception of loud sounds and reaction could save your life. Sevoflurane and Matt Richardson like this. I am 33 years old and have been an die hard headphone guy since I was maybe 18. I dont go to many concerts and I work in a quiet environment but I do notice that I am very sensitive to harsh treble and overdone midbass. I swear I get nausea from too much midbass, it stinks because i dont ever remember it being a thing for me before. I have seen this thread several times and had avoided it unconsciously, I guess, because I was having an immense "ear fatigue" issue from last summer to probably May of this year and I was afraid to know more because I couldn't deal with the idea that I might have done permanent damage to my ear. It has subsided, but I realized that more than the loud listening I may do from time to time, what was most affecting me was talking on my cellphone. The high treble of most calls - especially the sudden and intense change of volumes that happened often when I talked to my Dad before he passed in the Spring - were really shredding my eardrum! I have taken to using a wired pair of cheap headphones that filter a lot of that out. But mostly, I talk on speaker a lot more and avoid putting the phone to my ear as much as possible. My rule of upgrades is that the better the music sounds, the lower I can play it and hear everything there is to hear in the recording. I've gotten used to keeping the volume lower in general. I take a break whenever there's even a hint of ache in the inner ear. fogalu, Fishoutofwater, timind and 1 other person like this. Once you start to get that accumulated wear on your ears, your ears develop a sensitivity. The best thin you can do at this point is to put the headphones down and only listen to music in the background for a couple of months and give your ears some time to heal themselves. While permanent damage will never go away, so of the "irritation" that your ears are experiencing will get better if your ears are left in peace for a good long period of time. I am almost twice your age and did not have hearing stress before a concert back in 1012 and some overexposure to loud music back in 2014, which did result in mild but permanent hearing damage in my left ear. Give your ears this resting period, NOW!, see where you are in a couple of months. You may need to cut down the amount of time that you listen to music and certainly, ditch anything that goes into or covers your ears and produces sound, forever! Being that you are younger, you do have a chance to do some healing, but you will have to go easier for the rest of your life. If not, it is going to get worse and then your chances to heal will be greatly diminished. For me, I find over ear headphones allow me to reduce the volume. Noise cancelling cans at the gym or on a train are excellent. I also have tinnitus and some high frequency loss and am very careful with the volume control. I am not aware of tinnitus that completely comes and goes unless perhaps it is in the early stages. When i was 14-16 I had great headphones and used them extensively at great volume. Seeing where this may end in damage i got rid of them. I did play in bands for years and at 39 developed constant tinnitus, it never improved i just got used to it. Then from 41-45 I was a DJ and used in ear phones to cue up music over very loud speakers. Now at 50 i found i have lost differing amounts of HF in both ears but nothing unusual for my age group or previous exposure to loud music. Maybe I've been lucky, but I can't say that I've had the problems expressed here with headphones. Ive been a sort of amateur, bedroom variety audio engineer since my late teens. What I used to notice was a sort of ear fatigue after long mixing sessions using headphones. I would also lose the ability to discriminate to properly EQ tracks. After a day or so I would be fine. Like many, I listen to music on an iPod when I'm walking around. Lately my choice of headphones for this have been Sony WH1000-XM2 wireless headphones. Had my ears checked about 6 months ago, some mild hearing loss that is typical for an old guy. Having attended concerts by the likes of The Who in the'70's (crazy loud) I've left concert halls with ringing in my ears any number of times although I would be fine the next day. I strongly suspect guys like Clapton can attribute their substantial hearing loss to playing in front of stacks at insane volume levels early in their careers without hearing protection. From you description, it is not but something unusual for your age group. Although as we get older, I'm 63, we do loose HF hearing. Men will loose it at twice the rate as women at 8-kHz. See the chart below. While it seems that at a certain age, you can no longer hear above "X" number of cycles (above 10 kHz. ), that is not the complete story. We just don't start loosing our hearing at 20-kHz. and that figure keeps coming down lower and lower as we age. It is actually more of a natural hearing loss curve. So while your hearing may be down so many decibel's at over 10-kHz., since it is a curve, we are also down so many cycles at 8-kHz, at a certain age, which continues as we age. Beyond out 20's, very few have hearing up to 20-kHz. Audiologists are only concerned with hearing within a certain range and do not test above 8-kHz, because there is no fundamental speech information above that frequency. This graphic was linked from a page Listening and Hearing on the Roger Russell web site, these is a lot of good information here. basie-fan and All Down The Line like this. I have some ringing in my ears too, at times I notice it more than others so I can assume it is not too bad, comes and goes. Of course concerts are a big problem as volume has only gotten louder, so I now wear ear plugs. Big difference is when I leave the venue and I take them out I can hear and talk fine. In the past I remember not being able to hear for a few hours due to the ringing....I am sure I have damage. I don't use IEM much, only on flights and at home I only listen to my speakers. I also think IEM exaggerate the HF and that is what causes the headaches and ringing sometimes, they are not really full range. Kind of surprised there has not been some class action lawsuit against Bose or Senn or someone else. I don't think there is any cure for tinnitus, all I read is eat healthy lots of fluids and protection from further damage......When cutting lawn and using any tools I now use ear plugs also, lawnmowers are pretty loud. They say heavy caffeine use can make tinnitus worse too. The FRiNgE, frightwigwam and The Revealer like this. That’s me screwed then. If I went cold turkey on caffeine i’d end up in a coma. mcd4959, The FRiNgE, basie-fan and 4 others like this. People are very poor at estimating "a reasonable volume level" for headphones. The absence of room effects reduces loudness cues. The open back headphones help a bit but extended sessions on a headphone should be done at levels much lower than a quick listen and subjectively much lower than for in-room systems (Log distance effect and all that). You still can hear everything. Soundgarden, Sevoflurane, All Down The Line and 1 other person like this. I only use headphones to record music, I stopped listening to music with headphones years ago. I don't miss it. tested at work every other year if they catch me lol. But I did suffer with tinnitus in the right ear for over a year after a bad head on collision on a highway with a woman hell bent on killing herself. She came straight at me and took out my front wheel and transaxle of my F150 and totaled it. None of my airbags deployed but my head stretched my neck painfully to the right as the rest of me was thrown back by my seatbelt. Sometimes after exposure to loud music or noises that ear will ring for a couple of days still. This is an interesting thread. I have used headphones for many years but only experienced a problem with the Audeze LCD2-C. Unfortunately, my ears couldn't bear the pressure created by the air-tight seal and this caused me to experience pain similar to that when a plane depressurises during descent. I suffer badly during cabin decompression and never thought that I would suffer similar symptoms listening through headphones. The Audeze LC2-C is much heavier than my other headphones and has a very strong clamp. Damned cell phone! That's what I blame for my tinnitus. When I was working I would have the volume cranked up on the cell phone as I was usually driving when talking. I would do a lot of highway driving and would use the phone to keep from going crazy with boredom. After one fairly long conversation I hung up and noticed the left side of my face felt numb when I scratched my cheek. It took me a minute to realize my feeling was fine, but I couldn't hear my fingernails scratching which my brain interpreted as a lack of feeling. It took a while to decide to just never hold the phone to my ear. Now I only talk on the phone via speaker. As for headphones, I feel they are good for my tinnitus, especially classical music at moderate volume. I also find that the day after I get a good listening session in with the system, my ears are quieter than normal, I do keep an eye on the volume control. My ears have been hissing or ringing to some degree for at least 25 years. Years of loud music and working around noisy machinery are the most likely culprits. The last five years I have been using Bose noise cancelling headphones at work. I really make a conscious effort to keep the volume down. I do feel like my hearing is getting worse. My ears have been pretty sensitive for years. Being out in the wind and I need to stuff Kleenex in my ears or they will hurt. Seems like movie theaters are the same story. I've been thinking about getting my ears checked again. It's been over 20 years. I have recurring problems with my left ear.I'm not sure if it tinnitus or ear infections.If it is tinnitus I'm pretty sure it came from falling asleep on my side with headphones playing loud after a long night of drinking.I woke up with my ear hurting.That's one mistake I wish I never made. I use my cell phone at minimum volume, and usually that is too loud. If I am in a noisy environment, I don't crank the volume; I postpone the call. Everyone else I know has it maxed out; they don't know what they're doing to their ears. This is good advice. I got tinnitus eight years ago. Presumably from loud cars, music, power tools, sporting events, etc. It was a concert and then a professional baseball game that took me over the limit. I've had it ever since. As with others on this thread, I thought it would drive me mad at first. Really scary stuff. I learned to manage it and mostly I'm okay with it now. And I even take better care of myself as a result. Now my focus is on protection and preventing it from getting worse. I have hyperacusis as well, which is a sensitivity to certain frequencies that often accompanies tinnitus. It's the high frequencies that are the most troublesome. I can't stand it when someone's listening to music on a cell phone, for example. Nails on a chalkboard. I picked up a pair of Grado headphones recently. They sound amazing. But they are a bit grating for me compared to speakers. I'm getting ready for some travels and was planning on taking them. This post has me second guessing that. Actually, it's convinced me that's a bad idea entirely. I'll reserve them for light listening at home. Thank you for @Ghostworld for posting this and reminding us all to take care of our ears, not just so we can enjoy music, but so that we can enjoy life. fogalu, Clonesteak, Matt Richardson and 1 other person like this. Caffeine intake ramps up my tinnitus immediately.